Fort Lauderdale sailing is one of the top water sports in the area, as well as one of the most fun to watch. 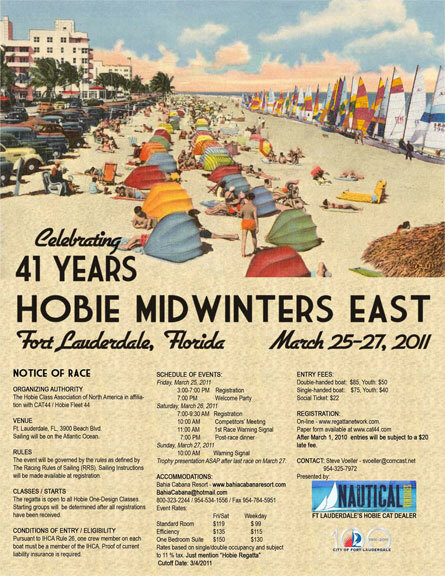 Hosted by CAT44, the local Hobie club, come watch the Hobie Midwinters East Regatta on Fort Lauderdale Beach’s south end from Friday, March 25 until Sunday, March 27, 2011. There will be some metered parking available on Fort Lauderdale’s south beach, but lately this parking lot has been going major renovation and many spaces have been unavailable. So the best bet for nearby parking is the Intracoastal public parking lot off of Las Olas Boulevard. The City of Fort Lauderdale is celebrating its 100th year and the regatta is an official event of the festivities. What’s more festive than watching dozens of hobiecats with over a hundred sailors vying for the trophy. You can find all the information about the Hobie Midwinters East at the CAT44 website.